For many years, Mark Russinovich was the outsider who found loopholes and issues with Microsoft's operating systems, then posted his findings to the company's chagrin. 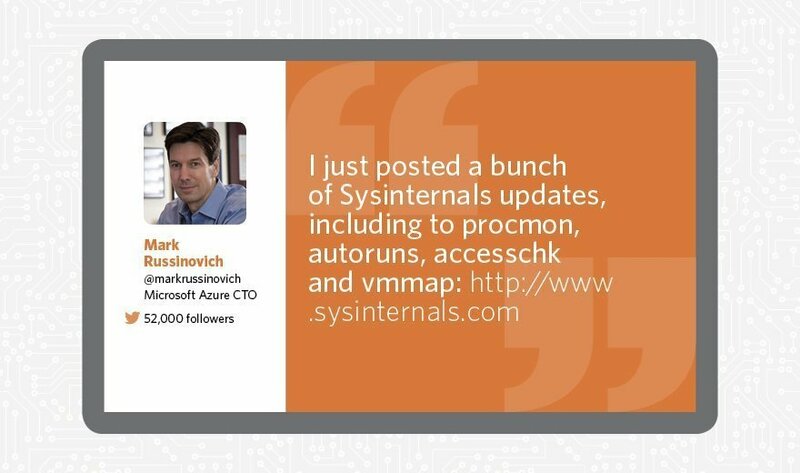 Russinovich also released many Windows Sysinternals utilities through the company he co-founded that helped Windows administrators do their job. In 2006, Russinovich brought his talents to Redmond, Wash., when Microsoft acquired Winternals Software. Since then, Russinovich has risen to the role of chief technology officer for the Microsoft Azure cloud computing platform. "It's important that I keep up with the latest trends and technologies," said Adam Bertram, an IT consultant and trainer. "By following Mark, I'm able to catch an early glimpse into what's coming down the pipe from Microsoft, particularly with Azure, which is gaining momentum." A jack of all trades, Russinovich has written several books with a technology bent and tweets several times a week from @markrussinovich to his more than 52,000 followers. He keeps his coding chops sharp by continuing to actively update software from the Windows Sysinternals site.